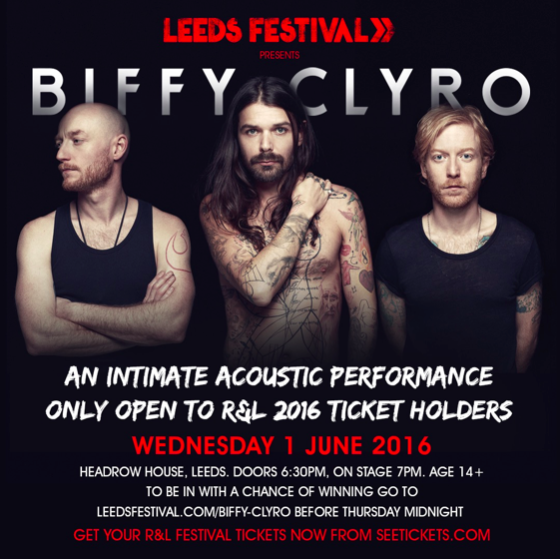 Reading & Leeds Festivals are delighted to announce an exclusive acoustic performance from 2016 headliners Biffy Clyro to take place at Headrow House, Leeds, on Wednesday 1 June. Performing at Reading & Leeds festivals for the 10th time this year, the phenomenal rise and success of Biffy Clyro lives within the festivals folklore. With their highly anticipated seventh studio album Ellipsis on the way, Reading & Leeds will kick off the summer by bringing a special acoustic set from Biffy Clyro to Leeds’ Headrow House. All Reading & Leeds ticket holders will be able to enter a ballot for the chance to win tickets to this exclusive performance. All successful ballot entrants will receive a confirmation email, with a link through to ticket collection, from 8:30am Friday 27 May. A transaction fee of £3.50 will be payable for each ticket. All proceeds will be matched by Leeds Festival and donated to local charity, Martin House. Biffy Clyro are one of five headliners for this year’s Reading & Leeds Festivals alongside Red Hot Chili Peppers, Foals, Disclosure and Fall Out Boy. They head up a sensational Bank Holiday Weekend also including performances from Jack Ü, The 1975, Imagine Dragons, Boy Better Know, Nas, Chvrches, The Vaccines, HAIM, A$AP Rocky, Good Charlotte, Fetty Wap, Twenty One Pilots, Eagles Of Death Metal and many more.